Too Many Civil War Books? The flood of books a couple of years ago commemorating the bicentennial of Abraham Lincoln’s birth got me wondering just how many Lincoln books our library could absorb. When so many titles get published at once, don’t many get overlooked, or does an event create enough interest that the books find an audience? The same thing is happening now with the sesquicentennial of the Civil War (1861-1865). Lots of books, many of them well reviewed, are being released and will be for the next few years. Where to start? A couple approaches might work. First, there are some excellent overviews of the entire era. “The Civil War: A Concise History,” by Louis Masur, covers the tensions leading to war, Lincoln’s election, secession, the war itself and reconstruction in a mere 118 pages. In no time at all, you can get back to trying to keep up with James Patterson. Less concise, Steven Woodworth’s “This Great Struggle: America’s Civil War” is more thorough. The Smithsonian Institution is involved with “Civil War: A Visual History,” published by DK, meaning it will contain excellent graphics. 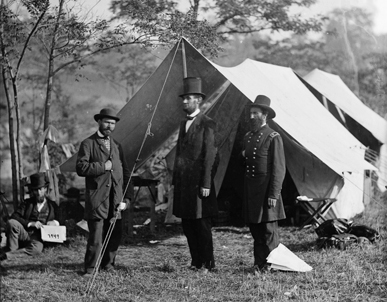 Ken Burns (yes, we have his landmark video series) contributes a foreword to “Discovering the Civil War,” a collection of original documents and photographs from the National Archives. Looking for revisionist history? David Goldfield’s “America Aflame: How the Civil War Created a Nation,” attributes the war to religious fundamentalism and manifest destiny in the North. “God’s Almost Chosen Peoples: A Religious History of the American Civil War,” by George Rable, examines the role of religion on both sides. One also could approach the war through different lenses. “The Grand Design: Strategy and the U.S. Civil War,” by Donald Stoker, would be for military buffs looking for a macro view. “Lincoln on War”collects the writings of the great man himself, revealing the lengths he was prepared to go to preserve the union. If the Civil War is a topic that interests you, there will be plenty to choose from this year. These and other books on the Civil War can be found on the second floor of the Iowa City Public Library. John Hiett is a senior librarian at the Iowa City Public Library. From weaponry to quilt squares, area youths learn about life in the Civil War at Spotsylvania day camp. The new recruits lined up, and one by one each private marched up for a rifle. 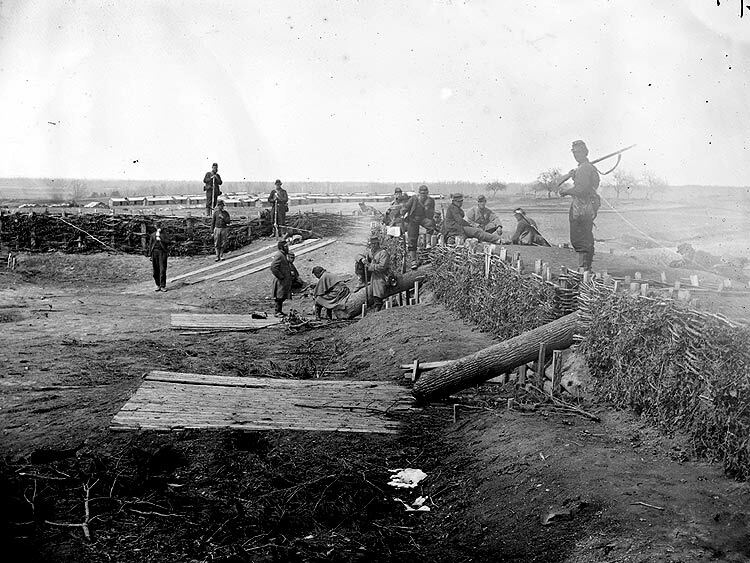 Decked in Confederate gray caps, hooded sweatshirts and sneakers, the soldiers seemed unsure of how to hold their weapons fashioned out of wood. The last private eagerly took hold of the rifle, although it towered over his head. Josh Fissel, a first-grader at Smith Station Elementary, was one of 24 children who learned about the War Between the States yesterday at Spotsylvania County‘s first Civil War Kids Camp. The one-day event happened on the final day of Spotsylvania schools’ spring break, and took place on the edge of the Chancellorsville battlefield at the county’s Lick Run Community Center. Costumed re-enactors led the students through stations focusing on various aspects of life during the war: marching, loading a weapon, setting up camp, sewing, taking care of the sick, spying, helping to free slaves and playing marbles. “One of our goals is to try to get a broader understanding and renewed interest in the history of our area,” said Eric Powell, a re-enactor with the 47th Virginia, Company I and the coordinator of social studies for Stafford County public schools. Most area schools spend a few weeks each year teaching the Civil War, he said. But yesterday, Powell helped students do more than memorize some key dates and read history books. “They’re learning without even knowing it,” said Debbie Aylor, visitor center supervisor for Spotsylvania. She planned the camp as a kickoff to the county’s sesquicentennial commemorations. Spotsylvania was the site of four major Civil War battles, and the county plans to mark the 150th anniversary of the war with numerous events. As a child, Aylor rode her bike over the historic ground and would relive Stonewall Jackson’s famed flank attack in the very woods where it occurred in May 1863. And that motto framed the camp. The youths came to the camp with varying knowledge about the Civil War. Some were eager to attend; others had to be prodded. The Hight brothers weren’t the only young Civil War buffs. Michael Gilchrist, a seventh-grader at Thornburg Middle School, came in his own period garb. He and his family participate in re-enactments, and Michael came to camp with a lot of Civil War knowledge. “But some things I was surprised to hear,” he said. He was especially intrigued to learn that abolitionists used quilt patterns as signals for the Underground Railroad. The Civil War Camp for Kids kicked off upcoming sesquicentennial commemorations. A major re-enactment will be held May 21-22 at Spotsylvania Courthouse. Most events will take place in Courthouse Village. For details, call 540/507-7094 or visit spotsylvania .org/2011.htm. Advance tickets are needed for events that Saturday night, and space is limited. Ask them their feelings, but also share yours. Slavery is a difficult issue for kids to understand, and war can be disturbing. But talking about the issues is important. Don’t just visit a battlefield–before you go, read books and study the battle. While there, look for historical markers and exhibits, and ask questions of any volunteers or park rangers. Complete the National Park Service’s Junior Ranger program. 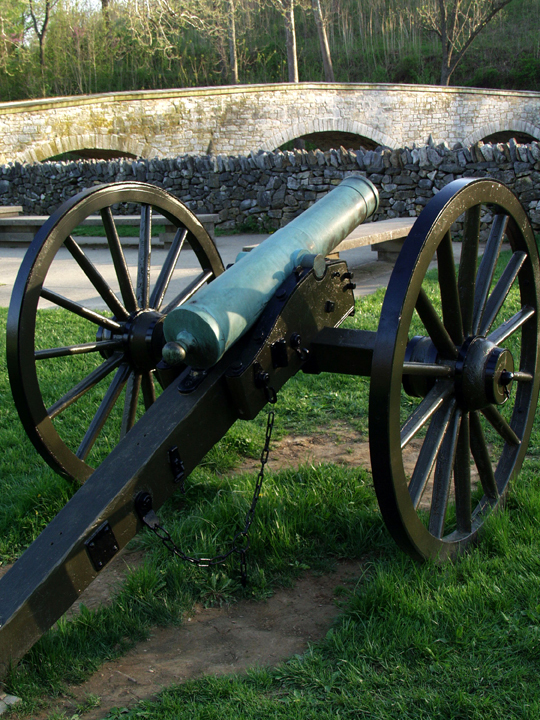 Try to visit a battlefield during the same time of year that the battle was fought. Attend re-enactments or living-history events. L. Brooks Patterson unveils map that plots key Civil War sites around Oakland County. Oakland County schools will have a new tool to help teach the history of the Civil War: a map of Oakland County and its significance to the Underground Railroad and other Civil War-era stories and events. Oakland County Executive L. Brooks Patterson presented the map in a program at the Governor Moses Wisner House in Pontiac on Thursday. The atmosphere was enhanced by re-enactment Union soldiers and the 5th Michigan Regiment Band in full Union regalia. “We can look back on it for years to come,” he said. Patterson’s goal is to get the 4-foot-by-4-foot map into every Oakland County classroom. A curriculum is being developed around the map by Carol Bacak-Egbo, a member of the Oakland County Historical Commission and an employee of Waterford Schools. “This map is a treasure trove of stories and facts for Oakland County students,” Patterson said. In addition to the Underground Railroad sites, the map includes stories of a woman disguised as a man working as a Union spy, a Rochester soldier spared from a Confederate hanging and a Lake Orion teacher who became a commander of Michigan’s 102nd Colored Regiment. The Rochester soldier, Samuel Harris, was responsible for the fountain by the Rochester Police Department; his tale is told in this Rochester Patch story. The project came to life about one year ago and was put in the hands of Melissa Luginski from the Oakland County Historical Commission. Though the map benefits Oakland County, the work was done by volunteers. One member of the crowd Thursday was quite interested in the event: 25-year-old Ryan Johnson of Rochester, a fifth-generation descendant of Gov. Wisner. Copies of the map can be purchased for $20 by contacting the One Stop Shop in the Oakland County Executive Office, 2100 Pontiac Lake Road, Waterford. WHEELING – Appalachian Regional Commission officials visited Wheeling Thursday to unveil a new tourism tool, Civil War: The Home Front Map-Guide to Appalachia, designed to boost the economy and attract cultural heritage tourists to the 13-state region. The national launch of the map-guide took place in the historic courtroom of West Virginia Independence Hall, birthplace of the 35th state. Participants noted that actions taken in the building in 1861-63 helped to preserve the Union and were pivotal to the nation’s fate in the Civil War. Developed for the 150th-anniversary commemoration of the American Civil War and to boost tourism in the region, the map-guide showcases the diversity of Appalachia’s Civil War heritage attractions. It offers “an enticement for tourists to visit these important places” remarked Travis Henline, the hall’s site manager. Nineteen sites in the Mountain State, including West Virginia Independence Hall, the Belle Boyd House in Martinsburg, Harpers Ferry National Park, the Shepherdstown Historic District, the Philippi Covered Bridge and Historic Museum, the Rich Mountain battlefield, Jackson’s Mill Historic Site, Grafton National Cemetery, Fort Boreman Civil War Park, Burning Springs Park and the Ohio River Museum (Marietta, Ohio) are featured on the map-guide, created in partnership with American Heritage Publishing and the members of ARC’s Tourism Advisory Council. The map-guide’s 150 sites were selected from more than 500 nominations for destinations and stories. The featured sites provide visitors with “a glimpse into the human element and human stories of life on the home front in the Civil War,” said Justin Gaull, marketing specialist for the West Virginia Division of Tourism. “We are happy to have this guide as a new piece to our information arsenal,” he added. West Virginia sites are seeking cultural heritage tourists because they stay longer and spend more money than any other tourists, Gaull explained. A cultural heritage tourist spends an average of $944 per trip, compared to $611 spent by all other U.S. travelers, he said. Explaining that the ARC’s mission is to create jobs, Gohl said the new map-guide is being distributed to promote heritage sites and provide opportunities for communities throughout the region. He remarked that the 150th anniversary of the Civil War is “a unique time in history” to offer this resource. The commemorative map-guide is available as a free insert in the spring issue of American Heritage magazine. Copies have been distributed by the tourism offices of ARC’s 13 states to targeted traveler mailing lists, regional welcome centers and tourism trade shows. It also is available as an interactive feature online atwww.visitappalachia.com, where additional information specific to each Appalachian state is offered to travelers. Observing that home front stories have been neglected, Edwin S. Grosvenor, editor-in-chief of American Heritage, said, “These are incredible stories … There are some amazing stories. It’s important that we get these stories out.” He added that home front stories can be used to teach the relevance of the Civil War. The map-guide highlights heritage farms, railroads, restored houses, historic downtowns, national parks, memorials, living history museums and other attractions . Todd Anderson, a representative of U.S. Sen Joe Manchin, D-W.Va., read a letter from the senator who said the new tool captures the historic significance and the tourism significance of the Civil War. “Preserving the history of our state and nation is vital to the cultural development of our country,” Manchin stated. Flynn Altmeyer, a field representative for U.S. Rep. David B. McKinley, R-W.Va., read a statement from the congressman who saluted “this innovative tourism initiative” and commended the Appalachian Regional Commission for promoting tourism and economic development. ARC officials said the cultural heritage tourism sector has been growing at twice the rate as the overall travel market, and Appalachia has six of the top 10 states most visited by travelers from this sector. WASHINGTON — You don’t have to look far for examples of how the Civil War stirs public debate 150 years after it began. Experts say schools can play a powerful role — and hold an important responsibility — in helping young people make sense of a complex conflict whose meaning continues to be hotly disputed in the public sphere. That debate is sure to be amplified, given the prominent attention the war is getting as the sesquicentennial begins this month. How schools teach the Civil War flares up from time to time. One recent example concerned a textbook on Virginia history found in many of that state’s public elementary schools. It came under fire last fall, after a parent complained about the book’s contention, widely disputed by historians, that thousands of blacks served as soldiers for the Confederacy. A review by a panel of historians of Our Virginia: Past and Present and another text from the same publisher, Five Ponds Press, led the state board of education last month to withdraw approval of both and to overhaul its textbook-review process. “I’m still waiting to come across the teacher … who believes that slavery was a side issue (in the Civil War),” said Paul C. Anderson, an associate professor of history at Clemson University, in South Carolina, who also has worked with many K-12 educators. “I have the exact opposite problem. If I get a question, it’s that a teacher considers the war to be a moral crusade (by the North), and it was not that way. “Apart from mentioning in passing that the Civil War happened, that’s about all you get in many states, regardless of region,” said Jeremy A. Stern, a history scholar who co-wrote a recent report by the Washington-based Thomas B. Fordham Institute that graded state history standards. Ms. Hardy rejects that charge. “There is nothing (in the standards) to suggest an equivalency” between the ideas of Lincoln and Davis, she said. The standards, she said, urge students explicitly to “contrast” the speeches. The board’s initial proposal, though, was not to “contrast” the two figures’ speeches. The wording was further amended when the board met months later, but Dan Quinn, a spokesman for the Texas Freedom Network, an Austin-based advocacy group, said he finds the language troubling either way. African-Americans relied on songs and symbols to communicate the locations of the Underground Railroad. 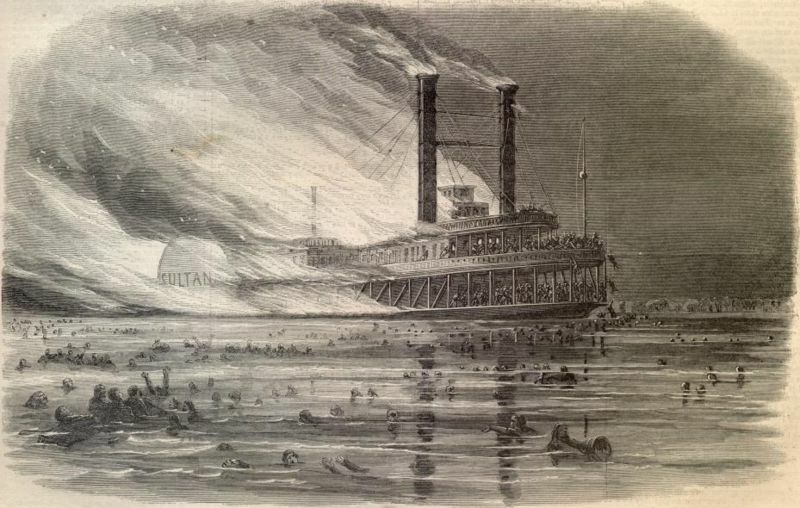 The explosion of the SS Sultana in 1865 resulted in the greatest maritime disaster in United States history. The Civil War was fought over more than slavery. Many students learn these important facts about the Civil War in the classroom, but a group of Maryville College students had the opportunity to learn about the Civil War through a more “hands-on” approach. Since late February, 24 students in Dr. Aaron Astor’s History 162: Introduction to the Study of History course have been helping curate a Civil War exhibit at the Blount County Historical Museum. “Courage, Conflict and Chaos: Blount County Celebrates the Civil War Sesquicentennial,” opened Friday and is part of the area’s Civil War sesquicentennial events. The exhibit, which includes Civil War artifacts, uniforms, flags, weapons, photographs and medical items, focuses on the Civil War as a whole, as well as the Civil War in Blount County, said Astor, assistant professor of history at Maryville College. Junior Katie Ammons described the class and museum project as “awesome.” A history major, she has been thinking about becoming a museum curator after graduation. “This class — seeing everything that goes (into curation) — just confirms that I want to do this,” Ammons said last week, when the class met at the museum to put up a timeline of the Civil War, hang displays and placards and arrange memorabilia in exhibits. Astor divided the class into groups, and each group has been working on a specific element of the exhibit. Ammons’ focus has been “the Civil War Homefront.” Other students have tackled themes such as the Africa-American experience or Blount County soldiers. Other groups have focused on artifacts, creating a Civil War timeline, plaque placement and creating captions for photographs. Astor has been preparing the pre-Civil War portion of the exhibit that focuses on causes of the Civil War. Maryville College sophomores Vinny Taylor and K.J. Bean said they were excited to get their own room in the museum — a room dedicated to the African-American experience. Among the items in the room they helped curate are a rope bed, straw-bottomed chair made by a slave near Nashville, daguerreotype of an African-American woman and a map of the Underground Railroad in Friendsville. Displays in the room explain the importance of the drinking gourd song and the monkey wrench quilt to slaves who wanted to escape to the North. “It’s incredible how the slaves communicated all those details (about safe locations) without formally speaking,” said Bean, a student from Knoxville. The Blount County Historical Museum, located at 1006 E. Lamar Alexander Parkway in Maryville, is open 10 a.m. until 3 p.m. Tuesdays through Saturdays and 2-4 p.m. Sundays. Admission is free, but donations are appreciated. For more information, contact the museum at 865-454-4526.